Postal address: H-9600 Sárvár, Várkerület utca 30/a. We have analysed the genetic pattern of oak decline through the comparison of subpopulations composed viable and declined trees growing close to each other on various stands. The applied sampling method excluded most of the site effects influencing viability. For the genetic investigation 6 nuclear microsatellite loci (ZAG1/5, ZAG96, ZAG110, ZAG9, ZAG11, ZAG112) and 7 isoenzyme loci (IDH_B, PGI_B, AAP_A, AAT_B, ADH_A, SKDH_A, PGM_B) were applied. The genetic diversity of the analysed subpopulations were evaluated by different indices, such as number of alleles, effective number of alleles, Shannon diversity index, number of private allele, expected- and observed heterozygosity, fixation index. The different tendency of results regarding isoenzyme markers in case of pedunculate and sessile oaks was a conspicuous speciality of the study. Higher allele diversity was detected in the declined pedunculate oak subpopulation, while in case of the sessile oaks the viable subpopulation showed higher values. A very similar tendency could be revealed with the calculation of fixation index based on the heterozygosity values. In case of the microsatellite markers the outstanding allelic diversity of the viable pedunculate oak subpopulation was remarkable. Based on the genetic distance among the analysed subgroups the two oak species compose two distinct clusters, and also the viable and declined subpopulations separate within the two main clusters. 1. Berki I. 1995: Éghajlatunk változása és a hazai tölgypusztulás. In: Tar K.; Berki I. és Kiss Gy. (eds): Erdő és Klíma Konferencia. Noszvaj, 1994.06.01.–1994.06.03. KLTE, 217–221. 2. Bohár Gy. 1995: Krónikus és akut stresszállapot, valamint a másodlagos károsítók és kórokozók szerepe a kocsányos- és kocsánytalan tölgy, valamint a cser pusztulásában. In: Tar K.; Berki I. és Kiss Gy. (eds): Erdő és Klíma Konferencia. Noszvaj, 1994.06.01.–1994.06.03. KLTE, 222–229. 7. Csóka Gy. ; Koltay A.; Hirka A. és Janik G. 2007: Az aszályosság hatása kocsánytalan tölgyeseink és bükköseink egészségi állapotára. In: Mátyás Cs. és Vig P. (eds): Erdő és klíma V. kötet, Sopron, 229–239. 8. Gömöry, D. 2000: Gene coding for a non-specific NAD–dependent dehydrogenase shows a strong differentiation between Quercus robur and Quercus petraea. For. Genet., 7: 167–170. 10. Hertel, H. and Degen, B. 2000: Distinguishing indigenous pedunculate and sessile oak (Quercus robur L. and Q. petraea [Mattuschka] Liebl.) using genetic and morphological traits. (Unterscheidung von Stiel- und Traubeneichen (Quercus robur L. und Quercus petraea [Mattuschka] Liebl.) mit Hilfe von genetischen und morphologischen Merkmalen). Forest Snow and Landscape Research, 75(1/2): 169–183. 14. Keresztesi B. (ed) 1990: A tölgyek komplex genetikai, taxonómiai és rezisztencia élettani kutatása, különös tekintettel a nemesítésre és az erdőpusztulásra. OTKA Zárójelentés, Budapest. 15. Mariette, S.; Cottrell, J.; Csaikl, U.M. ; Goikoechea, P.; König, A.; Lowe, A.J. ; van Dam, B.C. ; Barreneche, T.; Bodenes, C.; Streiff, R.; Burg, K.; Groppe, K.; Munro, R.C. ; Tabbener, H. and Kremer, A.. 2002: Comparison of levels of genetic diversity detected with AFLP and microsatellite markers within and among mixed Q. petraea (Matt.) Liebl. and Q. robur L. stands. Silvae Geneticae, 51: 72–79. 16. Müller-Starck, G. 1985: Genetic Differences between „Tolerant” and „Sensitive” Beeches (Fagus sylvatica L.) in an Environmentally Stressed Adult Foret Stand. Silvae Genetica, 34 (6): 241–246. 17. Müller-Starck, G. and Ziehe, M. 1991: Genetic variation in European populations of forest trees. Sauerländer’s Verlag. 18. Nei, M. 1972: Genetic distance between populations. American Naturalist, 106: 283–292. 21. Sander, T.und Franke, A. 1999: Genetischer Vergleich geschädigter und nicht geschädigter Stiel- und Traubeneichenbestände (Quercus robur L. und Quercus petrea (Mattuschka) Liebl.) in Baden- Württemberg unter besonderer Berücksichtigung von Standort, Bestandesaufbau, bisheriger Bestandesbehandlung und anthropogenen Umweltbelastungen. Projektträgershaft. Programm Lebensgrundlage. Freiburg. 22. Sneath, P. H. A. and Sokal, R. R. 1973: Numerical Taxonomy. W.H. Freeman and Company, San Francisco, 230–234. 25. Vajna L. 1998: A fák nemspecifikus betegségek okozta elhalása erdei és gyümölcsös ökoszisztémában. Növényvédelem, 34 (5): 229–241. 26. Varga F. 1980: A tölgypusztulás Magyarországon. Erdészeti és Faipari Egyetem Tudományos Közleményei, 2: 11–17. Berki I. 1995: Éghajlatunk változása és a hazai tölgypusztulás. In: Tar K.; Berki I. és Kiss Gy. (eds): Erdő és Klíma Konferencia. Noszvaj, 1994.06.01.–1994.06.03. KLTE, 217–221. Bohár Gy. 1995: Krónikus és akut stresszállapot, valamint a másodlagos károsítók és kórokozók szerepe a kocsányos- és kocsánytalan tölgy, valamint a cser pusztulásában. In: Tar K.; Berki I. és Kiss Gy. (eds): Erdő és Klíma Konferencia. Noszvaj, 1994.06.01.–1994.06.03. KLTE, 222–229. Csóka Gy. ; Koltay A.; Hirka A. és Janik G. 2007: Az aszályosság hatása kocsánytalan tölgyeseink és bükköseink egészségi állapotára. In: Mátyás Cs. és Vig P. (eds): Erdő és klíma V. kötet, Sopron, 229–239. Gömöry, D. 2000: Gene coding for a non-specific NAD–dependent dehydrogenase shows a strong differentiation between Quercus robur and Quercus petraea. For. Genet., 7: 167–170. Hertel, H. and Degen, B. 2000: Distinguishing indigenous pedunculate and sessile oak (Quercus robur L. and Q. petraea [Mattuschka] Liebl.) using genetic and morphological traits. (Unterscheidung von Stiel- und Traubeneichen (Quercus robur L. und Quercus petraea [Mattuschka] Liebl.) mit Hilfe von genetischen und morphologischen Merkmalen). Forest Snow and Landscape Research, 75(1/2): 169–183. Keresztesi B. (ed) 1990: A tölgyek komplex genetikai, taxonómiai és rezisztencia élettani kutatása, különös tekintettel a nemesítésre és az erdőpusztulásra. OTKA Zárójelentés, Budapest. Mariette, S.; Cottrell, J.; Csaikl, U.M. ; Goikoechea, P.; König, A.; Lowe, A.J. ; van Dam, B.C. ; Barreneche, T.; Bodenes, C.; Streiff, R.; Burg, K.; Groppe, K.; Munro, R.C. ; Tabbener, H. and Kremer, A.. 2002: Comparison of levels of genetic diversity detected with AFLP and microsatellite markers within and among mixed Q. petraea (Matt.) Liebl. and Q. robur L. stands. Silvae Geneticae, 51: 72–79. Müller-Starck, G. 1985: Genetic Differences between „Tolerant” and „Sensitive” Beeches (Fagus sylvatica L.) in an Environmentally Stressed Adult Foret Stand. Silvae Genetica, 34 (6): 241–246. Müller-Starck, G. and Ziehe, M. 1991: Genetic variation in European populations of forest trees. Sauerländer’s Verlag. Nei, M. 1972: Genetic distance between populations. American Naturalist, 106: 283–292. Sander, T.und Franke, A. 1999: Genetischer Vergleich geschädigter und nicht geschädigter Stiel- und Traubeneichenbestände (Quercus robur L. und Quercus petrea (Mattuschka) Liebl.) in Baden- Württemberg unter besonderer Berücksichtigung von Standort, Bestandesaufbau, bisheriger Bestandesbehandlung und anthropogenen Umweltbelastungen. Projektträgershaft. Programm Lebensgrundlage. Freiburg. Sneath, P. H. A. and Sokal, R. R. 1973: Numerical Taxonomy. W.H. Freeman and Company, San Francisco, 230–234. Vajna L. 1998: A fák nemspecifikus betegségek okozta elhalása erdei és gyümölcsös ökoszisztémában. Növényvédelem, 34 (5): 229–241. Varga F. 1980: A tölgypusztulás Magyarországon. Erdészeti és Faipari Egyetem Tudományos Közleményei, 2: 11–17. 2. Bordács, S., Nagy, L., Pintér, B., Bach, I., Borovics, A., Kottek, P., Szepesi, A., Fekete, Z., Wisnovszky, K. & Mátyás, Cs. (2013): State of Hungary’s forest genetic resources, 2010-2011. Bulletin of Forestry Science, 3(1): 21-37. 3. Tóth, J. A. 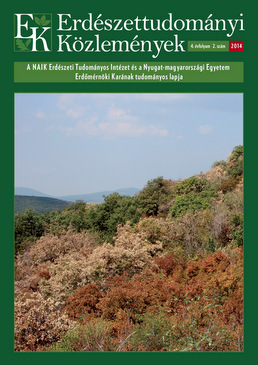 (2013): 40 years in a forest ecological research: The Síkfőkút Project. Bulletin of Forestry Science, 3(1): 7-19. 4. Cseke, K., Benke, A. & Borovics, A. (2011): Identification of poplar genotypes based on DNA fingerprinting method. Bulletin of Forestry Science, 1(1): 107-114. 5. Cseke, K., Bordács, S. & Borovics, A. (2011): Taxonomic and genetic study of a mixed oak stand. Bulletin of Forestry Science, 1(1): 95-105. Tóth, J. A. (2013): 40 years in a forest ecological research: The Síkfőkút Project. Bulletin of Forestry Science, 3(1): 7-19. 1. Koltay, A., Lakatos, T., Tóth, T. & André, Z. (2012): Biological control technology against Heterobasidion annosum root rot in Scots pine stands. Bulletin of Forestry Science, 2(1): 173-185. 2. Janik, G., Hirka, A., Koltay, A., Juhász, J. & Csóka, Gy. (2016): 50 years biotic damage in the Hungarian beech forests. Bulletin of Forestry Science, 6(1): 45-60. 3. Mátyás, Cs. & Borovics, A. (2014): "Agrárklíma". Bulletin of Forestry Science, 4(2): 7-8. 4. Borovics, A., Illés, G., Juhász, J., Móricz, N., Rasztovits, E., Nimmerfroh-Pletscher, B., Unghváry, F., Pintér, T., Pödör, Z. & Jereb, L. (2018): The necessity and steps of establishing a forestry climate centre. Bulletin of Forestry Science, 8(2): 5-8. Koltay, A., Lakatos, T., Tóth, T. & André, Z. (2012): Biological control technology against Heterobasidion annosum root rot in Scots pine stands. Bulletin of Forestry Science, 2(1): 173-185. Cseke, K., Jobb, Sz., Koltay, A. & Borovics, A. (2014): The genetic pattern of oak decline. Bulletin of Forestry Science, 4(2): 135-147. Opening a web page!